There is a new just-out documentary out about the New York Times: “Page One: Inside The New York Times.” Unfortunately, because of `conflict of interest,’ the Times own readers may be in the dark about how good it is. If you read the June 16, 2011 Michael Kinsley review of the film that appeared in the paper’s own pages you probably came away with the impression that the film is a god-awful mess and not worth seeing. You’d be wrong. Before I get around to some quibbles and tell you what I think is missing from the film (and what could possibly make it a better film) it should be made absolutely clear that this is a very good film and well worth seeing. Mr. Kinsley begins his Times review of the film disclosing why we might have to excuse his tin ear in evaluating the film: He explains that he knows “almost nothing about how The New York Times works.” The reason he, someone who professes to know nothing about the Times, is reviewing the film is, he tells us, is because the Times disqualified the more informed possible reviewers of the film as having a “conflict of interest.” That’s appropriate enough in that much of the film concerns journalistic ethics and the importance of reporting with a balanced and fair perspective. Unfortunately, while the resort to having Mr. Kinsley review this film about the Times may have circumvented a conflict of interest, it also demonstrated the sort of disservice to the public that can happen when the best journalists and experts are not covering their regular beat. If Mr. Kinsley is sincere in his disclaimer of having no knowledge regarding how the Time works before he watched the film then it is baffling how he can assert that after watching the film he did not “know much more than I did before.” Kinsley charges that the film utterly lacks discipline, flitting “from topic to topic, character to character” explaining little, “like a shopper at the supermarket without a shopping list” careering around the aisles picking up various items and ultimately arriving home without the obvious basics. While Kinsley’s descriptions suggest that the film lacks structure, its “fly-on-the wall” footage, revolves around two highly suitable armatures. First, most of what we see in the film is about the Times reporting news stories central to the current ongoing rapid evolutions in today’s news media. This “meta” approach causes the film to resemble and have a number of things in common with one of our favorite NPR programs, and one of our favorite sources of news, the weekly, “On the Media” produced in New York by WNYC. With both “On the Media” and “Inside the New York Times” this reporting about news reporting approach does double duty, teaching you about the media itself while simultaneously allowing one to absorb underlying stories. Beyond this, a critical advantage is that the approach constantly requires one to be rigorously conscious of the fact that stories are not just their facts but the perspective and fashion in which they are reported in the media. The second structure to the film is that it focuses on the personal story of reporter David Carr. Given that Mr. Carr is a media columnist for the Times this makes perfect sense in that it is consistent with the “meta” reporting-about-reporting approach just described. * He is hardly an “unlikely hero” of the film as Mr. Kinsley suggests. For instance, the film can follow Mr. Carr as a media columnist and reporter to industry conferences where participants and insiders are discussing where the industry is going. Carr is also a reflexive New York Times chauvinist. As he himself says in the film it is as if he had chip implanted in his head, making him so. A cantankerously feisty defender of the paper who lauds what he refers to as “New York Times exceptionalism”, Carr was redeemed by his commitment to the paper’s high journalistic values from a hard-living life of addictive behaviors (self described “violent drug-snorting thug” for which he was once imprisoned). This makes him a riveting spokesman for what the paper aspires to be. 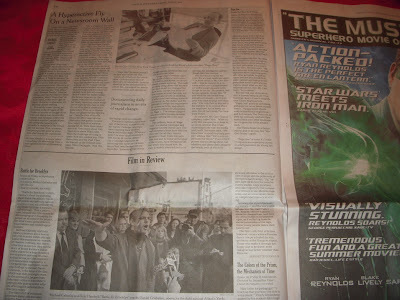 In choosing to structure the film in substantial part around Mr. Carr as its central protagonist the film makers made a choice very similar to the decision made by the makers of “Battle For Brooklyn,” another documentary released the same day and reviewed in the Times on the same page (see below). 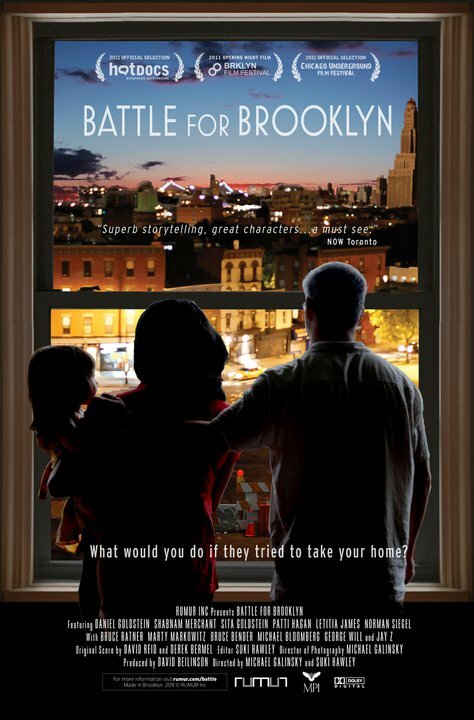 In a very similar way, “Battle For Brooklyn,” which is about the travesty and mega-boondoggle known as Atlantic Yards, tells its story by focusing on Daniel Goldstein, one of the key activists leading the principled fight to oppose the project. In its review of “Battle For Brooklyn” Noticing New York mentioned “Page One” because the stories told by the two documentaries are interrelated. Similarly we will return to discuss “Battle For Brooklyn” more in this review. Here is what “Page One” seems most notably to leave out of its story. There is only one mention in the film of public broadcasting, National Public Radio, American Public Radio and the Public Broadcasting System. The mention in the film made of public broadcasting is of its potential as a model for the way that it finances itself with listener and viewer contributions. The mention comes when it is explained how the Times is fishing about for the ways it can best finance itself to survive. The omission of any further mention of public broadcasting may be a significant a hole in the overall perspective the film provides, but it could be intentional because of the way it accentuates the drama of its central theme, which is that the Times is struggling financially to survive and that the Times is one of the last remaining bulwarks of essential, quality journalism. If the Times ever goes under, we will probably have to look mainly to public broadcasting for the kind of quality journalism the Times has been able to provide. While the Times has been laying people off, public broadcasting has been augmenting the role it plays, at least for those with access to computers (with the Times daily print edition at $2.00 that is probably the same segment of population that has access to the Times). Increasingly public broadcasting’s reporting is permanently available on the web and also transcribed into text, providing a record that is it searchable on the web. There is a story to public broadcasting itself (which we won’t go into) to the extent that the partial government financing it receives may impair its independence. That story was recently in the news given Republican attacks. As this didn’t happen within the year “Page One” was being filmed perhaps its omission from the film is understandable. The other thing largely missing from “Page One” is the story about coverage of local news. (There is a brief mention about how no one is covering the cop shot or local zoning board meeting in the Huffington Post- not exactly true*- but this was about it.) As seen through the lens of the film the Times is a national paper covering national stories. I think this is partly because the Times more and more wants to see itself this way. (It should also, obviously, help the film play better in theaters around the country). In effect, becoming a more national paper is one way that the Times can hope to survive. As other papers around the country fold, the Times can step in to fill the vacuum providing national and international news now no longer provided by others. Officially, the Times also still considers itself a local paper for New York as well. The one clue in the film is when we find out that it still runs two front pages, one for national consumption and one for local. We learn this, after a senior editors’ meeting being told that a story that was a candidate for the front page will “swing” appearing on one page but not the other. Still, the missing coverage of local news is a big story in itself and this is a vacuum the Times is not stepping in to fill. In fact, part of that story, as we will go on to discuss, is exemplified in the “Battle For Brooklyn” narrative concerning the Atlantic Yards economic and political fiasco. Press Release PR Driving Local Stories. . .
STEVEN WALDMAN: Right, or another example is that during a five year period the amount that state governments spent went up by about 20 percent, and during that same time the number of reporters covering state government went down by about a third. Anyone who has some concern about how tax dollars are spent on the state level, it's a bad formula. And it ripples through the system in a variety of ways. First of all, basic reporting functions like the covering of City Hall and the school board and the state house and health and education have gotten less and less. First, that means that reporters are relying more on press releases. BROOKE GLADSTONE: Which means the news gets driven by these government agencies and politicians, and not by probing reporters. STEVEN WALDMAN: . . . . . which basically is a shift of power from citizens to institutions - to government, to companies, because they're in a better position to drive the storyline. As told in the “Battle For Brooklyn” documentary a large self-interested development company (and subsidy collector), Forest City Ratner launched a public relations onslaught seeking to grab public and (via eminent domain abuse) private land. The Times, rather than questioning their suspect narrative was itself deeply involved in helping to promulgate it. 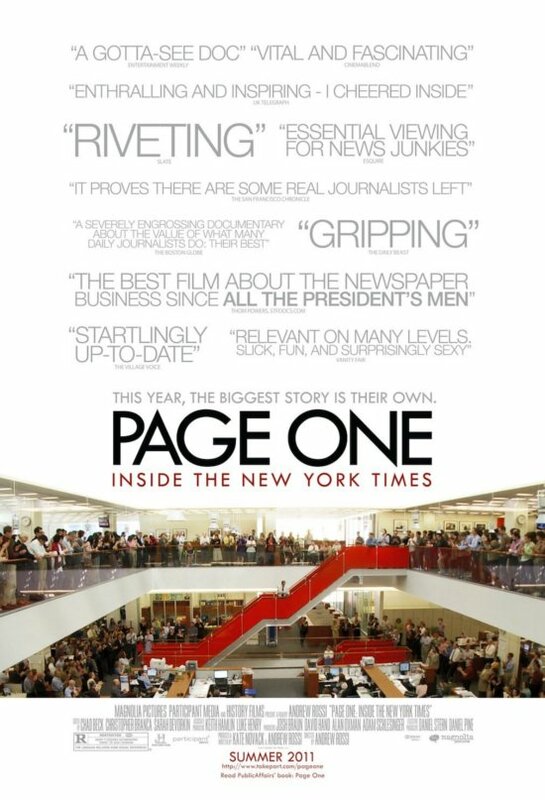 Before we return to discuss the negative influence the Times had in covering local news in New York (which the “Page One” documentary is not about) we should discuss what the “Page One” documentary is about, which will help put those negatives in harsher relief. The trailers for the film also make it clear that this is the main point. And if the trailers haven’t done it for you before you arrive at the film, the film begins with obituary news for publications like the Rocky Mountain Times that have gone out of existence. If the film were merely a statement that it would be a terrific loss if the Time went under there would be no need to see the film after seeing these trailers. But the film is really about what stands to be lost if the Times is not around to do its job. • WikiLeaks: Is Julian Assange a journalist or an activist, both, or are such roles mutually exclusive due to conflict of interest? How does an institution of professional journalism like the Times “partner” with Assange, if Assange is not, in fact a journalist and perhaps merely a “source” with an agenda? How does the Times respond when, with the internet, it is less of a gatekeeper for news stories when an organization like WikiLeaks can easily publish what is, in fact news. Should the Times be a gatekeeper so it can promote balanced reporting, draw public attention to the most important stories and/or support the public’s(? )/government interest in keeping some information classified? • “Departure of the last U.S. troops from Iraq”: Times staff is seen evaluating how and whether to cover the Obama administration’s orchestration of an August 2010 PR video camera photo-op non-event (a Kuwait boarder crossing covered by the major television networks), about how the “last U.S. combat troops” were being withdrawn from Iraq when that was neither the case nor something the Defense Department was willing to state formally in an official press release. This involves the rigor and vigilance it takes for reporters not to be manipulated by events manufactured for the press and designed to make “hallucinatory” appearances reported in the press take precedence over reality. I think the Times called it wrong by deciding not to featuring the event in its coverage although reporter Brian Stelter did a blog post in the “Business Day, Media and Advertising” section of Times site about how befuddled much of the media (NBC, AP, Fox News, the LA Times, the Washington Post, Al Jazeera) were by the government’s tactic. Those seeing the film get to see the government’s manipulation of the story but as the Times readers wound up uninformed about the pseudo-story nor and the manipulation. The abominable management and the falling revenues at the Tribune papers likely amounted to a vicious cycle-style free-fall. Carr comments that the “frat house”-like environment is more like “a radio station in the 1970s” than a newspaper. In a way it’s like a rolling back in time to less profession models of running a business. The story communicates how, as revenues dwindle and come from a smaller variety of sources, the putting out of a cheap paper (vs. a good one) can become the trivialized play of real estate moguls, with their own personal wonts and agenda. • Vice Magazine: The film covers the expansion of Vice, a magazine with on-line content representative of emerging new styles of media, via an infusion of cash from “some of the biggest names and deepest pockets in the media business” including an MTV co-founder and WPP, a giant media conglomerate. (See: Vice Media Empire Is Near a Big Infusion of Cash, By Jeremy W. Peters, April 4, 2011.) What gets discussed is what is truly newsworthy vs. what amounts to sensationalism and superficial pandering to young people and also the role of trusted brands in news delivery. • Coverage of presidential travel: The importance of having reporters out in the field covering the president is discussed in the context of how expensive it is to travel with the president. Other orgaizations looking to “save every dollar” are not doing it. On the other hand, some things are cheaper these days: Who knows what a bored kid with video cameras can capture on the cheap. • News sites that no longer curate their own headlines: With computers and new web technology it is possible for news sites to let their top headlines be determined robotically, simply by how often their readers click on them. The Times has variations on this with its “most popular- e-mailed- blogged- viewed” lists. Just because new organizations can abandon knowledgeable curation of their most important headlines doesn’t mean that it is a good thing. • Release of the iPad: The nearly irrational exuberance accompanying the introduction of the iPad provides an occasion for the film to consider whether the new technology can “save the newspaper business.” Carr caustically point out that the Venn diagram of Steve Jobs financial interests at Apple are not likely to overlap 100% with the media industry’s. • The Pentagon Papers (a historic Times success) and Watergate History: There is fascinating audio from the Watergate tapes wherein President Nixon is discussing his antagonism to the New York Times and implicit desire to control the news. 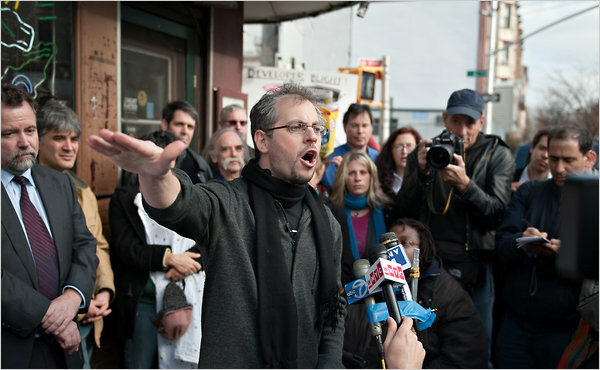 Daniel Ellseberg appears in the film to make the inevitable and elucidating contrasts with the current Wikileaks news. Similarly, there are retroactive references to Watergate. • Judith Miller and Jayson Blair (historic Times failures): In an interview, Judith Miller addresses her infamous weapons of mass destruction cheerleading on the way to the War in Iraq saying, “If your sources are wrong you are going to be wrong.” It is suggested that the “implied credibility” of the Times contributed to the Miller story not being better vetted. * The Jayson Blair scandal, involving unvetted news stories fabricated by Mr. Blair that quickly got Howell Raines, the then Executive Editor of the paper, fired is cited for the loss of trust it created chipping away at that “implied credibility.” Mr. Carr points out that most criticism of the Times based on such mistakes amounts to cherry-picked fault-finding given the volume of high quality journalism the Times puts out. Michael Tomasky, Editor of Democracy Journal and American Editor-at-Large, Guardian recently made the same point in a debate on the subject covered by Noticing New York. • Web Aggregators: As mere publication in itself becomes free, the Times has been perplexed by non-content-producing web sites that gather content from other Web sites without paying for it thus, as the Times sees it, forcing the Times to compete against its own work. The film mentions sites that repurpose New York Times stories and stories on other web sites that “bounce off of” Times reporting. This is probably the time to note that Noticing New York frequently posts articles that “bounce off of” stories by the Times and others. It is hoped that, in the process, NNY is rigorous about adding new value and insight into what is covered and respectful about sending NNY back to those sites to look at the original content to which NNY posts refer. • The institution of a Times paywall: The Times after considering all sorts of models is instituting a paywall. But it is a challenge in a world where information is regarded, perhaps immaturely, as free. • The loss of Times revenue: The web has taken an incredible amount of revenue from the Times and other papers. Craigslist took most of the classifieds. Monster took the job listings. Advertisers do more of their advertising on their own web sites; the film mentions Ford and Chrystler. We went to the film with a real estate brokerage executive who commented that their firm had cut back on their advertising expenditures in the Times by an astounding amount, advertising instead on their own website. It is in connection with the Times new pauperish status that the new Times building is discussed. The Times’ sale and lease back of the building is explained to be the equivalent of having mortgaged it. The film doesn’t suggest that the initial self-compromising decision to partner with Forest City Ratner and resort to eminent domain to build that building in the first place might also have had aspects of financial desperation. • Layoffs at the Times: We watch as the Times lays off roughly 100 people out of 1250 when, according to Executive Editor Keller, there is “not much slack in the system.” With barely concealed irony the film zeroes in on a departing deputy editor of obituaries. • Partnerships with ProPublica: Somewhat similar to public broadcasting, ProPublica is an independent, non-profit newsroom. It specializes in investigative journalism that is in the public interest. It has been pairing with “legacy media” to report and get attention for its biggest stories, working with the Times and others like CNN and 60 Minutes. The film explains that these “partners” from the legacy media have been financially forced into this new model. Previously, they would likely have been deterred by concerns that the shared responsibility would associate them with work they could not fully vouch for. • The departure of a reporter for Iraq: Fortuitously for the film makers, one of the media reporters they were covering when filming, Tim Arango, was tapped to change jobs and go to Iraq. He later became the Times Bagdad Bureau Chief. The film uses this opportunity to focus on personal relationships at the newspaper and also to emphasize the courage and personal risk that can be required from reporters. Probably overreaching a bit, it suggests that bloggers don’t report from war zones. Granted, courage and risk is required for many reporters when they to do their jobs, different kinds of courage and risk from different kinds of reporters. Does it need to be pointed out that all of the above are collectively about the need for fair, balanced, expert, rigorous and professionally impartial reporting? The above stories are also all about how the implicit reputation the Times has for delivering such reporting. That leads to another subject of the film. There is actually something called the “New York Times Effect.” In the world of analogue newspapers there was an observable effect. If on day one the New York Times ran a piece on a particular story, political or business issue; on day two, the tier two newspapers would all essentially imitate the story. The Times still does to a remarkable degree set the agenda. You really can trace almost any major story these days back to something that originally appeared in the Times. The problem is that once it reaches the public they may not even know that it came from the Times. “The Times Effect” is described in the film after we have been reminded via a vintage earlier documentary hosted by a young Alistair Cooke that the Times goes through an “avalanche of news” in order to decide what will get noticed and how many, including world leaders, view what is “duly recorded each day in the Times” as necessary proof, virtually for the world’s very existence. NBC, CBS, ABC, the first thing they do in the morning is look at the New York Times. And if the New York Times had a story about such and such in a far away place - Well then we will send Walter Cronkite over there. On May 24, 2005 New York’s Metropolitan Transportation Authority (the “MTA”) put out a perfunctory RFP soliciting bids for the railyards it was planning to transfer to developer Forest City Ratner. The 42 page RFP was a palpably insincere gesture. It allowed only an absurdly short 42 days for response. It was 42 pages whereas the MTA’s comparable later RFP for its Hudson Yards railyards site ran 1,369 pages. Doubtless, all the city’s big developers correctly perceived that, as a political matter, they were NOT supposed to bid against Forest City Ratner because even though the public property of the railyards had never been bid, this was viewed as a done deal. In fact, according to statements that the MTA later retracted in connection with court proceedings, the MTA considered that it had already sold the rights to the Yards to Forest City Ratner prior to September 2003. Clearly not expecting a response, the MTA planned to act on the Ratner plan on Wednesday, July 6, 2005, the same day that responses to the RFP were due. The MTA put out a proposal leaving all of 42 days to put together a proposal. Somebody had the idea to call this other developer: This developer had owned property and had plans to build a large building, but Bruce Ratner had the state condemn that property to build the New York Times headquarters. Somebody suggested they might be interested, and they were right. Ratner with their partner the Times are doing a leading promotion on how wonderful Frank Gehry is, and his plan is, how he respects the neighborhood, isn’t it just great! In fact, on July 6, 2005, the developer Goldstein contacted, Extell Development, put in a bid of $150 million against Forest City Ratner, three times as high as the Forest City Ratner bid of only $50 million. The Extell bid was actually arguably of even greater comparative value to Forest City Ratner’s because it was only for the 8.4 acres of railyards and did not involve eminent domain abuse to lock up an additional 13.6 acres of private property with a questionable upzoning. Providing the same or better creation of affordable housing, it didn’t involve the same overbearing immensity as the Ranter plan, nor did the Extell bid involve enormous subsidies of a billion or more for a money-losing basketball arena. On July 27, 2005, the MTA Board authorized exclusive negotiation with FCR rather than with Extell.- - Gary Barnett, the president of Extell, commented when interviewed later that, “We are shocked—shocked—that we bid $150 million, [compared with the] Ratner bid $50 million, yet he somehow managed to get it” thus invoking Captain Renault’s acknowledgment of the open tolerance of corruption in Casablanca. The Times briefly reported (May 26, 2005) the issuance of the MTA’s RFP but printed nothing picking up on its bogus character. The bogus character of that bid deserved to be major story. The brief report of the RFP came several days after the Times ran a story under a press release-style headline touting that the Ratner project would theoretically provide lots of affordable housing: Brooklyn Arena Plan Calls for Many Subsidized Units, by Michael Brick, May 20, 2005. Goldstein’s concern about how the Times was promoting the Ratner project virtually as if its was an extension of the Times existing real estate partnership with Ratner was well founded and prescient. On July 5, 2005, the day before the MTA board planned to approve the project, not expecting the pending Extell proposal in response to its solicitation, the Times published a front-page article about the Atlantic Yards project (Instant Skyline Added to Brooklyn Arena Plan, By Diane Cardwell), when Frank Gehry's new design sketches were released exclusively to the Times. In an accompanying "appraisal" the Times architectural critic effused over the fantasy design (An Appraisal: Seeking First to Reinvent the Sports Arena, and Then Brooklyn, by Nicolai Ourousoff). Does it look like the Times stories were being selectively tailored by the Times to help the Ratner project? Certainly, Ratner knew the schedule for various events related to the bid during this window, not that it would have been appropriate for public officials to have been feeding him all these details. Ratner was therefore in a position to, in turn, feed appropriate stories to the Times. The far more ambitious $3.5 billion Ratner plan deals with those issues, and has the very important advantage of carrying with it a commitment to create jobs for area residents, including minorities and women, and to build as many as 3,000 affordable housing units - 50 percent of the total planned. That's significant in a borough with high unemployment and a housing shortage. But it is not reasonable to reject the Ratner plan simply because Brooklyn has never before seen anything that big. The area seems ripe for more adventurous ideas. . . .
. . . . Such a transformation is almost inevitable in a city where growth is usually vertical, and if it happens in Brooklyn, it could help diversify the city's Manhattan-centric economic base. . . . . If counted as a separate city, Brooklyn would be the fourth largest in the United States. The potential for developing the Atlantic railyards site furthers the prospect that it will may yet emerge from the shadow of its smaller sister, Manhattan. During this window of time, Times reporter Charles Bagli produced a June 3, 2005 story starting out with a reference to the “2012 Olympics and the proposed West Side stadium,” warning that, “the legacy of these [arena] projects in other Olympic cities is mixed, and skeptics have raised questions about whether some of New York's would become costly white elephants after the Games are over and the athletes have moved on” (After Cheering Stops, Arenas Would Endure; New York Faces an Olympic Reality: Sites Can Become White Elephants). This was just days before a vote in the Albany capital killed the West Stadium. Many would agree that Times coverage helped kill the stadium. More important is where the Times editorial page (closer to Times management) was on the subject of subsidizing sports stadia and arena a bit later in the month when it ran an editorial critical of the over-generous plans for public funding of the Yankee Stadium and Mets, and the by-then-defunct West Side Jets Stadium. The Times did not similarly criticize the comparably generous public financing for the Atlantic Yards arena then, or ever afterwards. The sports section also managed to drop in a promotion for Ratner’s pending bid: Bench Battle of 2 Lawrences Taking Shape, by Harvey Araton, July 22, 2005. In lieu of criticisms . . .
After decades of disinvestment in Brooklyn, major projects are in the works, among them the development of 175 waterfront blocks, complete with 40-story luxury apartment buildings, along the Greenpoint-Williamsburg waterfront; the construction of an 800,000-square-foot sports complex for the Nets in the Atlantic Yards; and, in Red Hook, the return of cruise ships, including the Queen Mary 2 and the Queen Elizabeth 2, to a major new pier and passenger terminal. Here we are, so many years later and you start scratching your head and you say, ‘Well, I see the arena going up, the steel is rising, but I don’t see any housing, the famous architect’s gone,’ it fed the notion that this was a hollow accomplishment. The reason the MTA’s decision to negotiate exclusively with the Ratner firm was, in theory, justified was because Ratner was going to provide all of those supposedly superior benefits that Bagli notes have now not been provided. The benefits may never be provided, and Forest City is not now obligated to provide them for at least 25 years instead of within the ostensible ten-year schedule that was part of the original PR (and environmental impact statement). That the benefits have not materialized is directly attributable to the corrupt fashioning of the of the MTA’s original RFP bid request and partly due to the MTA’s gift to Ratner, again without any effective bid, of substantial sweeter terms after the mega-project was later overhauled in the developer's favor. The obvious insincerity of the bid request, as well as the objectionable selection of the lower, rather than the higher bidder should have provided easy-to-spot clues respecting the ultimate failure to deliver promised benefit. The way the bidding was structured it was doomed to fail. That is because it was designed by Ratner to give Ratner exactly what he wanted and exactly what he should not have been given for exactly the reason he wanted it: a single-developer mega-monopoly for the deployment of all public funds ($2 - $ billion*) for 22 contiguous acres of Brooklyn’s most prime real estate, more than thirty acres if one counts the contiguous acres already owned by the developer which the developer was trying to protect from development competition. Arguably, had the Extell developer been selected, the benefits of the Extell plan would have been provided by now. But if they hadn’t, the community would not have been subjected to another 13.6 acre of eminent domain abuse destruction where land now lies fallow. Further, if the MTA site had been divided up and bid out to multiple developers, as it should have been, per the model of Battery Park City, then any non-performing developer could easily be quickly replaced which would itself encourage performance. Ergo, much of the failure goes to what the Times did not report on and the mistaken impression it gave of the Ratner plan benefits in that critical window of time when Daniel Goldstein sat in his apartment complaining of “The Times Effect” playing out with respect to Atlantic Yards. The difference in those bids could be a problem for the Ratner proposal, even though it has far more political support. The agency's board, which is set to choose between the two offers at its monthly meeting on Wednesday, may have to contend with a new law that requires it to take the highest offer, without regard to any political considerations. Assemblyman Richard Brodsky, a Westchester Democrat, said that the authority "ought to live by the law," which was passed in June but does not take effect until late this year. In a further complication, an appraisal commissioned by the transportation agency and released yesterday put the value of the development rights at $214.5 million, far more than either bidder is offering. Those three paragraphs might have been fair waning to a populace that was on alert, but the public had been lulled by many longer, more prominently featured pro-Ratner PR stories. The “new law that requires it to take the highest offer, without regard to any political considerations” referred to above was violated by the MTA a second time when it, again, bid out a substantially reconfigured version of the mega-project when Forest City Ratner could not meet the terms upon which the project had originally been awarded to it. When community groups and legislators sued because of its violation a judge ruled, essentially, that even though the New York State legislature had passed a law to this effect it could not be enforced because the legislature forgot to say that there should be anyone who could go into court to enforce it. What was the MTA’s argument for violating the law yet again as it continued with Ratner and a reconfigured project without bid? : It reasoned that the structure of the original ersatz bid giving Ratner monopoly control over the acreage made substitution of a new developer impractical. In other words, everything hinges upon what the public didn’t know and appreciate during that May 24, 2005 to July 27, 2005 window. Cancelling Out “The Times Effect”? Lest one think that The Times Effect might not have been strong or that it might have been cancelled out, for instance, by `citizen bloggers,’ that is not the case. Atlantic Yards was announced accompanied by a fullout publicity press. Little information was available other than what the publicists wanted out. If the Times was not going to do its job, it was going to take some time for others to mobilize and fill in. It is important to remember that this was back in 2005. That’s eons ago in internet time. Lots of people know that Atlantic Yards Report can be depended upon these days to scrutinize all aspects of the Atlantic Yards megadevelopement. However, back during this critical window of time, Atlantic Yards Report didn’t exist, nor did its predecessor, TimesRatnerReport. On September 1, 2005, after all these MTA bid events had concluded, independent journalist Norman Oder issued a report criticizing the Times's coverage of the Atlantic Yards which includes much of what was observed above. Two of the telling headings in that report: “8. The Times has soft-pedaled FCR’s track record of gaining subsidies for its projects and failing to fulfill the visions promised.” and “14. Times architecture critics have been cheerleaders for the project.” Bill Keller was Executive Editor of the Times then as he was during the critical window of time when the MTA bids were out. Could these `citizen bloggers’ make up for the Times not doing its job? David Carr is adamant that they can’t. He is probably right. But any argument that `citizen bloggers’ can’t surpass the Times and often do a better job of investigative reporting is abjectly wrong. There is, for instance, no way that the Times coverage of Atlantic Yards in any way measures up to the depth, accuracy, timeliness and vigorous digging done by Norman Oder as in independent blogger-journalist. At the outset of “Page One,” the audience is told that the Times is suffering from two things simultaneously. It is not just suffering from the collapse of advertising revenue, it is also suffering from the way in which, with the internet, journalism is no longer practiced by a (superiorly-resourced) specialty class which means that the “authoritative tone of Times” is called into question. It is not likely that simple. Probably, as came into play after the Judith Miller and Jayson Blair affairs, what buttresses or undermines the Times’ “authoritative tone,” more than anything, is whether it gets things right or wrong. And sometimes, maybe whether it gets it at all. Does any of that matter, if the paper covers the issue fairly? No, not really. “We report fully and fairly on any newsworthy project, ours or others’,” he further wrote. Interestingly, the reporter who wrote so with such casual dismissiveness, is Matt Schuerman who later, at the Observer and then at WNYC, the city’s public radio station, wrote and broke stories much more consistent with Mr. Oder’s revelations as opposed the Times sidestepping. There may be a number of respected press institutions to keep the Times looking over its shoulder nationally and internationally. In New York City when it comes to real estate matters there are two daily papers of significantly less stature: The Daily News owned and run by real estate mogul Mortimer Zuckerman, and the New York Post owned by Rupert Murdoch, frequent friend of New York real estate moguls. Another small circulation paper, the New York Sun went out of existence without surviving many years. The New York Observer is a weekly. For a time it looked as if the most significant competition in keeping up the delivery of Atlantic Yards scoops the Times could ignore was going to come from local community papers whose readership apparently found that those development stories were hitting close to home. The Brooklyn Paper, in particular was covering Atlantic Yards. That changed when Rupert Murdoch bought the Brooklyn Paper along with many other local community newspapers he was acquiring. Forest City Ratner coincidentally, or not so coincidentally became the Brooklyn Paper’s landlord. The Brooklyn Paper went from actively and critically pursuing Atlantic Yards stories (and winning awards for it) to ignoring potentially negative stories about Atlantic Yards and printing PR fluff from the developer. With an efficiency that gives the public fewer options and points of view, The Brooklyn Paper now runs the same stories as Murdoch’s New York Post and other community papers. Murdoch also owns the Wall Street Journal which many view as a Times competitor nationally (potentially locally with expanded coverage) together with the Fox Broadcasting Company which also delivers news to New Yorkers. New York Magazine which has also covered real estate development in New York City, sometimes more so , sometimes less so, was owned by Murdoch from 1976 until 1991, into which he folded Cue Magazine, a competitor he bought and thereby eliminated. When Murdoch purchased New York Magazine he also acquired The Village Voice, which has been from time to time responsible for important investigative journalism in the city. He sold the Voice in 1985. Does competition provide a sufficient check on the Times reporting of local news in New York City? To sum it up, “Page One,” is a good film, well worth getting out to see. There is a lot to be learned from it. There is a also lot to be learned by stepping back to consider it in broader context. It is interesting to think that the Times considered it would be a conflict of interest to have one of its own professional staff to review the documentary, that this alone might cross a line wherein the Times would be reporting a story about itself. This sidelining of the normally depended upon professionals resulted in an inadequate review. That’s ironic because “Page One” asks the question: What if press professionals were not around to do their job? The aspirational goal probably needs to be to avoid the conflict of interest in the first place. “Page One” contemplates how disastrous loss of the Times would be almost entirely by considering the prospective void we would face with respect to national (and international) reporting. But, if the FCC study is correct, the greater immediate danger being faced around the country is an inadequacy of local reporting that can hold governments and big institutions accountable. Mr. Carr offers a cryptic aphorism at one point in the film: “If you work for the media long enough, eventually you’ll type your way back to your own doorstep.” It seems, in fact, to have worked out that way. There’s a big story going on in New York and it’s unfolding on the Times' own doorstep. The public was crookedly sold a lot of hype and hooey with the help of politicians who are not being held accountable. These unfolding events include the meta-story of how the Times is reporting on its own real estate partner who concocted that hype and hooey. That makes “Battle For Brooklyn” a powerful companion film to see with “Page One.” Both films address the question of what can happen when the New York Times is not around to do its job. As discussed in connection with the FCC report on local reporting needs and with “Page One” by Times staffers, professional journalists should not be passive conduits of PR and they should not be taken in by publicity substituting “hallucinatory” appearances for reality. It is unbecoming when they swallow hype whole failing to provide perspective. Suggested rules: Don’t be seduced by the sensational and shun the superficial. That may be difficult in a world of increasingly short attention spans. Rigor and fact checking are important and as, Judith Miller can caution: “If your sources are wrong, you are wrong.” Stories that are handed to you full blown by others may have cooties. Be wary of the self interest of others you may consider your partners or salvation. You’ve got to check under the hood. Carr suggests that reporters must be willing to “walk past the conventional wisdom” and think for themselves. Good reporting often takes courage. That may entail not just going with the flow. Yes, the job is getting more difficult. As resources dry up and news organizations shrivel in financial stature they can become the abused playthings of wealthy moguls. In fact, wealth and consolidation in the media industry itself is a story affecting the telling of the all our news stories and the attendant question about how many voices are out there that will say what needs to be said. A big part of the story lying on the Times’ own doorstep is how “The Times Effect” comes into play. When one of the instruments you wield in doing your work is your “authoritative tone,” extra responsibilities must follow. With great power and authority comes great responsibility. The responsibility is awesome when you lead the reporting pack, set the agenda and can virtually define reality by what you deign to “duly record” as the paper of record. Conversely, if your “authoritative tone” is one of your most valuable assets then you owe it to yourself to husband that asset by getting the story right, properly use it so as not to lose it. And there is always the possibility that “implied credibility” of the Times will be trap, breeding complacency. Complacency, particularly with respect to local reporting, is apt to be more entrenched if other news outlets are diminishing in quality. "Page One" not only frets that the Times could go out of business, the film’s fret also extends to the `what ifs” were the Times to be significantly diminished, something it suggests has not yet happened. The Washington Post is cited as a cautionary example. First it is respectfully noted that the Watergate story was pretty much “owned” by the Washington Post. Then we are informed that “diminishment has made the Post a lesser paper” but assured that “hasn’t happened to the Times in a meaningful way.” Perhaps, though, the Times has, in fact, already been diminished and that where it has been diminished is in its local reporting. It is easy to make that case by pointing out that the narrative of “Battle For Brooklyn” has been largely unreported by the Times even though the narrative involves billions of taxpayer dollars and is an unparalleled story of abuse assisted by public officials. (Though not dealt with in "Battle For Brooklyn," I consider chronicles of events regarding Columbia’s takeover of West Harlem part and parcel of the same story.) The “Battle For Brooklyn” story is, in fact, the kind of thing the Times might even swoop in to report if it were happening elsewhere in another U.S. city. Hindsight vindicates that the Times reporting lacked even rudimentary prescience about the mischief afoot. When it comes to national reporting and the Times missteps with Jayson Blair and Judith Miller it is possible to say that these were isolated faults amongst a wealth of truly fine reporting. Can the same be said of the New York Times local reporting? One difference is that the Times openly admitted and atoned for its errors with respect to Blair and Miller. Hindsight notwithstanding, that is something that Times has not yet done with when it comes to its local reporting of Forest City Ratner’s exploits. Maybe the Times fears that admitting such error will further detract from the stock people put in its “authoritative tone” but not reporting this story as it should be reported likely hampers the Times because we live in a world were everything is ultimately connected. For instance, the local Atlantic Yards story is also now also involves a national scandal involving the abusive sale of green cards under the EB-5 program. . . and the Times hasn’t reported about it. “Page One” convinces us that the Times is a superlative newspaper, one that can and should be held in high esteem in many regards. It is. But there is a story happening on the Times own doorstep which the Times reporting is not doing justice and that may soon be discovered to be a bigger part of the story than many now imagine.